I am getting back on the wagon this week – the meal planning wagon, that is. Not that I ever really fell off. I mean, I always have a plan when going shopping. But lately it hasn’t been all that inspiring for multiple reasons. 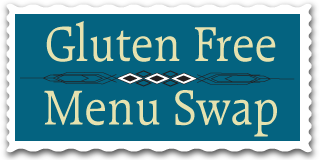 This week’s Gluten Free Menu Swap is being hosted by Wendy at Celiacs in the House and the theme is “what’s in season?” Here at our house we only have kale, lettuce and cilantro ready for picking, all cool season plants. The warm season plants are now finally all planted and already growing! I happily sat outside a bit over the weekend in the morning, sipping my tea and watched our bees buzzing around, pollinating the tomato plants and such. And the chickens pecking around at their scratch. So bucolic. I only need my dream goats! What have you planted this year to enjoy later in the season? I knew we should eat up some of the kale since it is getting pretty warm and it won’t be growing for much longer. And I didn’t make it to the farmer’s market this weekend so I don’t have anything else very seasonal this week. Well, some snap peas for my lunches. And lettuce and cabbage for lunch salads. That said, here’s our plan. Pasta with White Beans and Kale – a new-to-us recipe, which I will double to make sure we had enough for two entrees and leftovers. Chicken Tikka Masala with Rice and Steamed Broccoli – instead of chicken, we will use two cans of drained and rinsed chickpeas. San Marzano Deep Dish Pizza with Mediterranean Salad – have you seen Pete’s new deep dish pizza recipe? It looks delish! I can’t wait to try it! And if the weather cooperates with us better next weekend to where we can actually keep the grill lit – Yummy Grilled Tofu and Vegetables. What’s your plan this week? Be sure to head over to Celiacs in the House later this week to check out all of the other Gluten Free Menus for some more inspiration! I’m loving all the salad ideas you have this week, Renee.